Choosing a wedding date is an essential part of the wedding planning process, and you want to make sure you choose the perfect one! 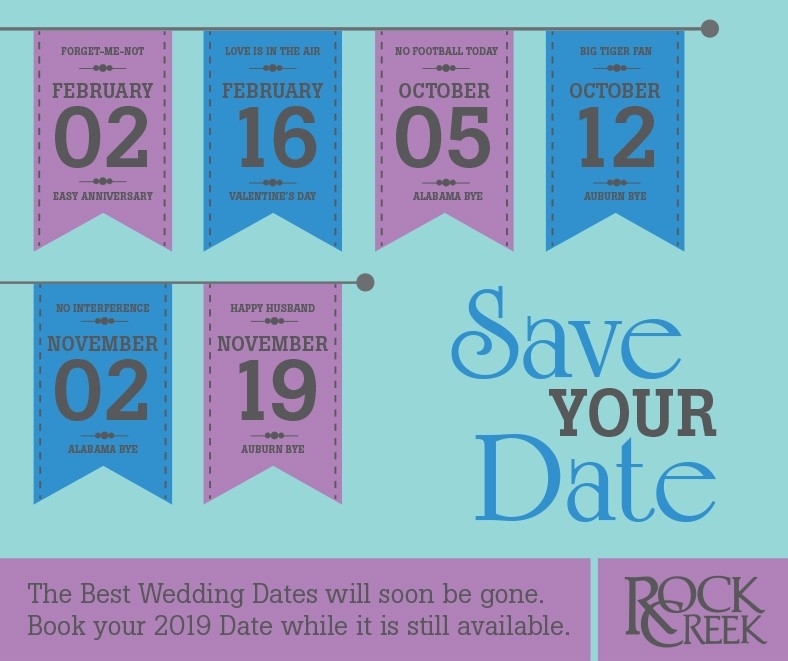 We have compiled a list of things to consider when selecting your 2019 wedding date. Choose a date that is important to you, whether it’s the day you first met, your first date, first kiss, or any other event that was monumental in your relationship. Do you envision cozying up by the fireplace, nights in the hot tub, and skiing the slopes? Then a winter wedding would make sense! If you’d rather sip cocktails out of coconuts in the Bahamas, choose a date that would complement that honeymoon! If you've always dreamed of a romantic Christmas wedding, choose a December wedding. At Rock Creek, we completely decorate the Clubhouse with poinsettias, nutcrackers, wreaths, and a huge Christmas Tree. Incorporating these decorations into your wedding will help your wedding budget go further! Or start your new life together by welcoming a brand new year with a New Years Eve Wedding! In the south, football dominates every Saturday during the fall and winter EXCEPT bye weeks. Alabama’s bye weeks are October 5 and November 2. Auburn’s bye weeks are October 12 and November 19. Make sure to check your favorite team’s bye week and reserve your date so there’s no “interference” on your big day. Our lives are busy, schedules are hectic so go easy on yourself with an easy to remember wedding date, which translates to an easy to remember anniversary date for the years to come. You will be thanking yourself for the rest of your marriage when you choose these easy to remember dates!